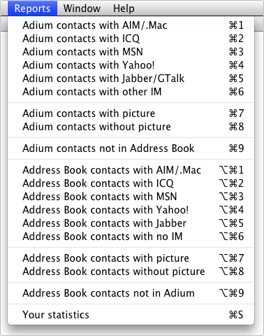 AdiumBook – Sync Adium and Address Book. Now works with Adium 1.3 and newer. Fixed the display of Adium pictures. Added automatic software update (Sparkle). New reports for Adium contacts: list by IM service, with/without picture. About box with SVN revision number and link to the app sources. Distribution DMG changed to ZIP. Tons of reports for you! This release took me 29 work hours to be made. I hope you like it! Read the full changelog, download and leave a comment to share your impressions about this release. Besides the new full text search on the Find buttons, the reports still search only by service. This is desired, because you still need to fill the correct IM field in Address Book for those contacts. Tiger users: This release just works in Leopard. The Adium bug on AppleScript for Tiger was not fixed (see issue #5), we’ll have to wait until the future Adium 1.3 release. For now, you must use AdiumBook 1.3 and Adium 1.1.4 or older. Download and leave a comment to share your impressions about this release. Program name changed from Adium Book to AdiumBook. License changed from “pick your favorite” to BSD. Adium version 1.2 came with a brand new AppleScript support. Although more powerful and flexible, it broke compatibility with previous Adium versions. This demanded huge changes in AdiumBook, a lot of code was rewritten using the new syntax. Starting from this release, AdiumBook will only work with Adium 1.2 or newer. You can continue using the previous AdiumBook 1.3 if your Adium is 1.1.4 or older. Support for multiple accounts in Address Book view – Finally! Performance tweaks – Now it’s even faster! The Help menu is improved, read it when in doubt! Check out the new multiple accounts support, now you can handle them all. Tip: To copy to the clipboard the selected IM, just Right click it. New Help menu with… Help! Note: Sorry, no multiple IMs support for now. Maybe on next version. 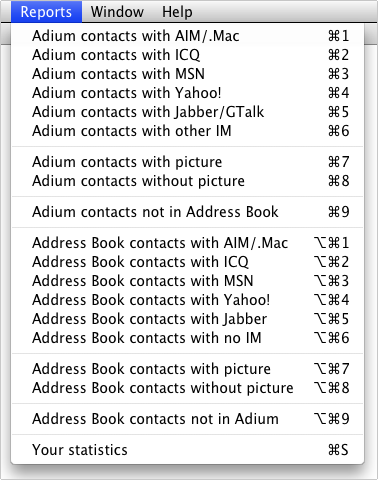 Google Talk accounts on Adium are mapped to the Jabber field on the Address Book. AdiumBook sees both Jabber and GTalk as the same kind. When in doubt using the program, just click on the new Help menu. It has detailed explanation of all buttons and reports. Check out the new “Reveal” button, it’s cool!